At Cory Liss Orthodontics patients’ health and wellbeing are the foremost concern – so educating patients on the need to keep all orthodontic appliances clean is an important step in maintaining excellent oral health. 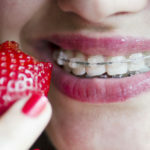 After the first few days of wearing braces your teeth will start to feel like normal and you’ll be ready to eat more regular food. Remember to stay away from the high sugar, super sticky and super hard stuff – you don’t want to break a bracket off or loosen a wire.